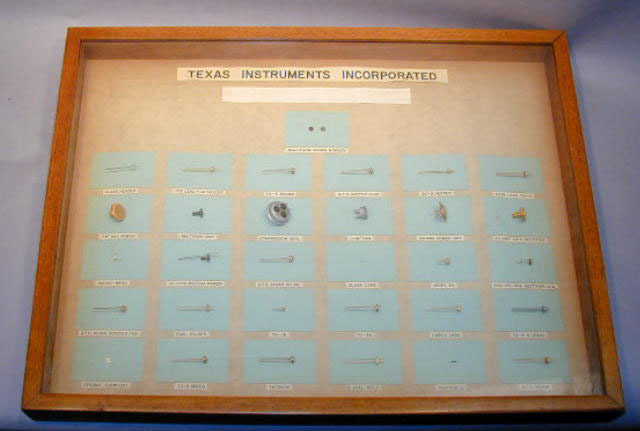 This display case contains miscellaneous glass to metal seal headers built by TI for transistors and rectifiers. This is a display built to show some of the wide variety of headers built in Hermetic Seals for use by the Semiconductor Group. The examples in the display indicate it was probably built in the early 1960's. The Hermetic Seals operation was started in the spring of 1959 and counted through 1982. During that period, it produced nearly 100% of the hermetic packages required by TI. Related material in collection: G00278-9, 288-90.